The foil-puncturing tool pivots in and out of a recess in the red frame. The cartridge-tip cutter is the circular hole to the right of the spring. 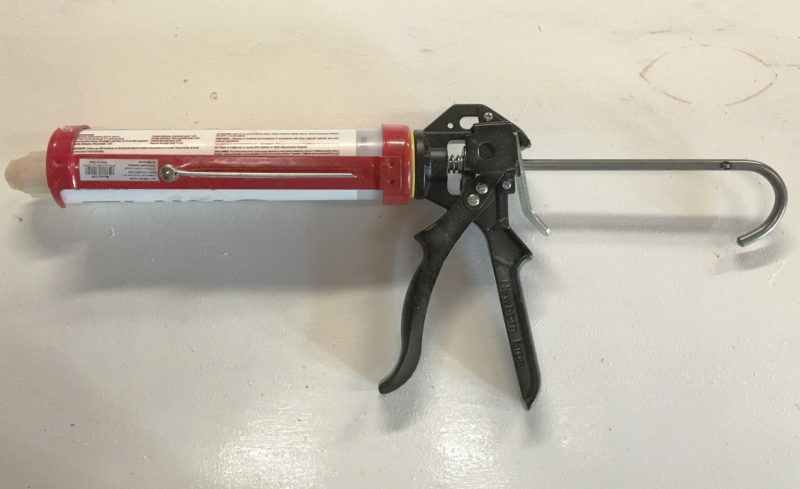 For years we used the common caulking guns that go for a few bucks at hardware stores; we assumed one caulking gun was like any other and accepted that dispensing thick caulks and adhesives just takes a lot of effort. That was until we starting using the Newborn High-Thrust Model 250 caulk gun. The 250 has an 18:1 thrust ratio, compared to the 6:1 or 8:1 thrust ratios of the cheap caulk guns from home-improvement stores. The 250 takes standard 10-oz cartridges and has a heavier feel and the construction is higher quality; the powder-coated frame and zinc alloy handle should hold up well. As with most caulk guns, it has a cartridge-seal puncture tool so you don’t have to go looking for a nail long enough to get to do the job, and a built-in tip cutter that will cut a cartridge tip off square or at a slight angle. If you need an angled opening at the tip, a utility knife is the tool for the job. The 250 has a handy ladder hook on the tail end of the plunger, which we use to hang the gun on our tool shelf so it doesn’t go missing during a project. The hand grip has a nice ergonomic design to it, making it easier to hold and squeeze. The 250’s revolving frame allows the cartridge and its tip to rotate as needed for ease of application at different angles to the work. The tips for mixing two-part epoxy increase resistance to the flow of the material, but the 250’s high thrust ratio makes it easier to dispense. 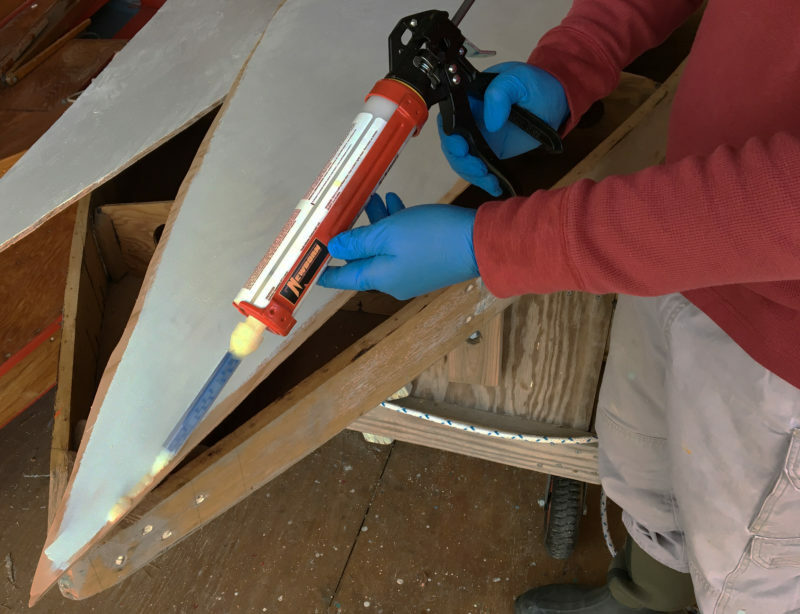 The high-thrust gun is well suited for use with thick caulks and adhesives and with mixing tips for two-part epoxies. With our previous caulk gun, I could barely force resin and hardener through a mixing tip, and at times I had to use both hands to squeeze the trigger to get a dribble of mixed epoxy to appear—very disheartening when we were looking at dispensing four tubes of epoxy. Our best test of the Newborn 250 is to load it with a tube of two-part epoxy that is thickened for filling gaps and making fillets. When I squeeze the trigger, even with minimal force, the gelatinous epoxy flows through the mixing tip. The action on the handle is smooth, and the force required easily just half that of a regular gun. The challenge now is to keep from squeezing the trigger with abandon and dispensing the material too quickly. The 250 has a trigger-release lever at the back to take the pressure off the plunger and stop the flow from the cartridge. For thinner materials that require less thrust than the 250 applies, there are drip-free guns that have a plunger that springs back automatically when you relax your grip on the trigger. With the Newborn 250 it will be very easy to work through several tubes of thickened epoxy on our current wooden restoration project. We are delighted to have found a tool to make this task much easier. 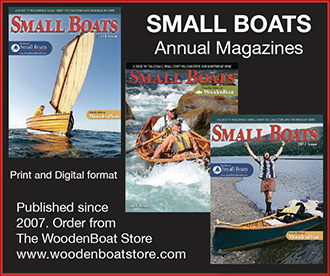 Kent and Audrey Lewis, aka Skipper and Clark, sail, row, paddle and motor a fleet of small boats, with boat repair and restoration being another necessary hobby, which they document on their blog. The Newborn High-Thrust Model 250 is available from several online retailers with prices starting around $23. I heartily endorse this tool. The Newborn 250 is a godsend if you have to apply epoxy fillets to long seams. Before I learned about this caulking gun I heated cartridges of epoxy on a radiator to soften them up, but I still ended up with painfully sore hands the next day. I also endorse this tool. The one I have is probably 20 years old, made in England. It is holding up well and always brings a smile to my face when compared to those junk guns.